In many professional fields, uniqueness will give you an edge over the rest in your particular area. This is generally because of two reasons; people love change and uniqueness draws curiosity which in turn gives birth to interest. Again, when you do it differently, especially in comedy, the services you offer to the masses always come out as original. Nobody wants to spend time listen or watching to something they have heard or seen before. This is just one of the approaches Carrot Top Las Vegas has employed to win a lot of followers. The red locks and props makes him very unique and original. In fact,his style has been christened observatory humor by many people since your are left in stitches as a result of what meets yours.Nobody has ever been able to imitate or copy his act; other comics have admitted over time that it’s difficult to imitate his act because unlike words, coming up with a visual pun is hard nut crack. His approach makes it difficult for any other person to sell what he does better than him. He writes his own material and makes his own props. Carrot top, we can say confidently, enjoys some kind of monopoly when it comes to this.He actually describes himself as a culmination of George Carlin,Steven Wright and Gallagher.George Carlin is the "father" of observational humor,Steven Wright is said to have set the benchmark as far as stand up comedy is concerned and Gallagher is normally believed in this field of comedy to be the "owner " of the props. Many comedians and singers admit when interviewed that they saw some talent in them when they were young.If you talk to popular musician or great comedians,they will tell you that in their young ages,they used to do the same to guys either in school or any other social gatherings.The journey to natural talent normally starts from the tender ages. It was different for Carrot Top Las Vegas, the first time he took a mic to address a crowd was when he joined collage at the Atlantic University in Boca Raton, Florida. He says, as a freshman, he once went to a bar and saw stand up comedy,like any one else,he admits it drew his attention but never thought it was something he could pick up later. But then while in campus, his room mate would occasionally tell him to pursue comedy as he was very funny. One day, an opportunity presented itself, the bulletin board around campus gave notice of an open mic night.His room mate implored upon him to try until he got convinced. Contrary to his belief, the event turned out well and people liked his show. This is when it dawned to him that he had some hidden talent. His second attempt was when he went with his first prop onto the stage, The joke was so well received that he would never perform without a prop going forward.The rest,as they say, is history. After establishing a massive following in the comedy industry, he went into television and his first appearance on”Comic Strip Live”in the year 1991.He says his breakthrough was when he appeared on “The Tonight Show”in the year 1992. That appearance sold his unique brand to every household in America.The response throughout the country was amazing and that is where he met his luck. After a noteworthy 31 appearances on television, Carrot Top additionally had the honor of showing up on the last scene of "The Tonight Show Jay Leno" on February 6, 2014. 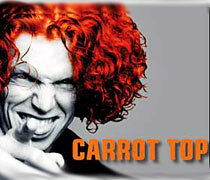 Carrot Top's different credits include several TV projects namely " Regis and Kelly," "Politically Incorrect Maher," "The Late with Craig Ferguson," "Late Night O'Brien," "Quality Simmons' Family Jewels," "Chelsea Lately," "Last Comic Standing," "Criss Angel—Mindfreak," "Tom Green Live", "The Neighbors", "Tosh.O", ESPN plugs, and Classics' of "Three Stooges" . He recently showed up on the hit "Merriment" and was additionally hosted during Oprah Winfrey Network's meant to find where famous actors and other celebrities can be found in her talk show "Where are they'.Not withstanding his various TV appearances, Carrot Top likewise featured largely in his movie..These are just some of the few major projects he has been involved in,if I were to write about each and every detail,then the list would seemingly be endless.Majority of people who were presnt in the early eighties and nineties can not deny that Scoot Thompson was the comedian in majority of peoples lips.Even though he started long time ago,Scott has been able to remain adaptable to the present world,his jokes are still very up to date even today. Carrot Top came from a humble background in the later years 1980’s to becoming the most sought after visiting comedian in United States of America in the later years of 1990’s.He admits that it went from small to big in such a short period of time that he had to employ people who would carry his props. He says in one of the interviews that there was a time he had to use a trailer to carry his props.Then came the deal that every comic wants to land,He ratified a very lucrative deal which is long term at the Luxor Casino and hotel and Casino. Here, he performs more than two hundred shows a year at the Theatre.Fans flock the theatre occasionally because no one wants to be left out of Carrot Top Las Vegas infectious and addictive humor. Carrot Top has been performing in Las Vegas for a long period of time,it is in fact his second home.Let us join together in making his tenth anniversary the best he could ever get.